WSJ has an informative article on the carbon footprint of six products. First came organic. Then came fair trade. 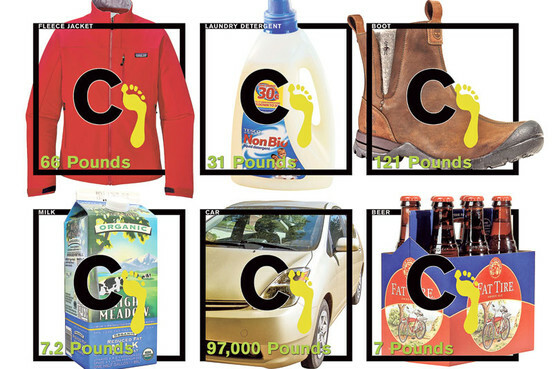 Now makers of everything from milk to jackets to cars are starting to tally up the carbon footprints of their products. That's the amount of carbon dioxide and other greenhouse gases that get coughed into the air when the goods are made, shipped and stored, and then used by consumers. In the Gelsi household, reducing their carbon footprint is a family affair -- they even wrote a musical about it. MarketWatch reporter Steve Gelsi offers tips for saving the environment and saving money while doing so. So far, these efforts raise as many questions as they answer. Different companies are counting their products' carbon footprints differently, making it all but impossible for shoppers to compare goods. And even if consumers come to understand the numbers, they might not like what they find out. Patagonia had a dose of reality calculating transportation was 1% of the carbon footprint. Patagonia Inc.'s Talus jacket looks like a naturalist's dream. In fact, its carbon footprint is 66 pounds. That, Patagonia notes on its Web site, is 48 times the weight of the jacket itself. Over the past year, the Ventura, Calif., outdoor-equipment maker has computed and posted on its Web site the carbon footprints of 15 of its products. Because most of Patagonia's products are made in Asia or Latin America and sold in the U.S., the company expected that a big chunk of the carbon footprints came from transportation. It was wrong. The fabric for the Talus is made in China, the zippers come from Japan, and the jacket is sewn in Vietnam. Yet all that transportation adds up to less than 1% of the product's total carbon footprint, Patagonia says. The majority of the footprint -- 71%, or about 47 pounds -- comes in producing the polyester, which originates with oil. "If we had listened to the rhetoric out there at the time, which was all around miles, we could have spent years rearranging our supply chain to reduce transportation, when really that's not the bulk of our concern," says Jill Dumain, Patagonia's director for environmental analysis. "There's a lot of reasons to have a tight supply chain, but environmentalism isn't one of them."